Sometimes, the dark horse trots into the winner's circle. Fishermen's Energy LLC, a company that has proposed a five-turbine, 25-megawatt offshore wind farm near Atlantic City, N.J., yesterday was named one of three offshore wind developers to receive up to $47 million in Department of Energy funding (E&ENews PM, May 7). Of the seven contenders vying for a DOE award, Fishermen's Energy was the only fully permitted project. But over the past several months, the New Jersey Board of Public Utilities (BPU) has twice denied bids by Fishermen's to participate in a state program that would obligate utilities to buy power from the wind farm, in part because the developer had not yet secured the DOE grant. Fishermen's filed an appeal of the agency's decision to the New Jersey appellate court Monday, according to attorney Stephen Pearlman, outside counsel for the developer in its case against the BPU. New Jersey Gov. 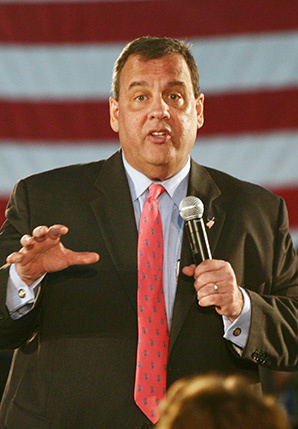 Chris Christie (R) is getting U.S. Department of Energy help for an offshore wind farm his state rejected. Photo courtesy of the governor's office. "We will undoubtedly raise in a prominent place in our appeal that we simply cannot understand how Fishermen's Energy has been treated by the BPU on these issues," Pearlman said, arguing that the agency could have waited for DOE's decision before it denied the developer's motion for reconsideration in late April. "We cannot understand how they did not wait when such a large amount of money was to be determined," Pearlman added. "We view the DOE grant as a complete and total vindication of everything that we have been saying." New Jersey Senate President Steve Sweeney (D) also chided the BPU in a statement following the DOE announcement yesterday. "Unfortunately, the BPU does not understand the incredible benefit that offshore wind would bring to New Jersey's economy," he said. "At least we know that the DOE sees the value." Some New Jersey-based environmental advocates have openly speculated that ahead of the next presidential election, Gov. Chris Christie (R) may have influenced the BPU's actions in an attempt to distance himself from renewable energy. New Jersey Sierra Club Director Jeff Tittel said yesterday that Christie "continues to hold offshore wind hostage to his national political ambition." The governor's office did not respond to a request for comment on Fishermen's Energy's win. Is $47M enough to win N.J.'s approval? "From an initial field of over fifty applicants, Fishermen's Atlantic City Windfarm project competitively won two rounds of deep analysis by the DOE," Chris Wissemann, CEO of Fishermen's, said in a statement yesterday. "Fishermen's is confident that the N.J. Board of Public Utilities will recognize the vetting by the DOE of the project, and will now engage with Fishermen's to finalize our [offshore wind renewable energy certificate] application so the project can proceed expeditiously." In a press call with reporters yesterday, DOE Assistant Secretary for Energy Efficiency and Renewable Energy David Danielson implied that his agency hopes the funding announcement will aid the developer's cause in ultimately winning state support. "One thing that we're hoping is that a team, by having gotten this award ... it may have an impact on the actual offtake agreement approval process," Danielson said. 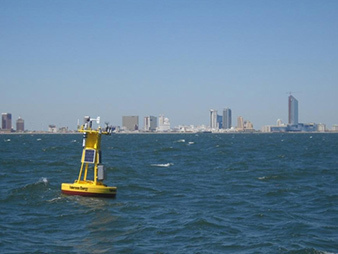 A buoy measures wind power at a proposed offshore turbine farm near Atlantic City, N.J. Photo courtesy of Fishermen’s Energy LLC. But Danielson also cautioned that Fishermen's has only reached phase "2-A," meaning that the developer must secure power buyers by next May to receive the full $47 million. "If a team is not able to get an offtake agreement, then they won't go forward," Danielson said. Two other projects, one spearheaded by the University of Maine and another led by the Lake Erie Energy Development Corp. in Ohio, were selected as alternates that could receive full DOE funding if Fishermen's Energy is unable to reach an agreement with the BPU. Lewis Milford of DOE's Northeast Wind Resource Center and the Vermont-based Clean Energy Group said that Fishermen's Energy's situation demonstrates how the offshore wind industry desperately needs better coordination between states and the federal government. "We have an exquisite policy mess around offshore wind," Milford said. "If we're serious about offshore wind going forward, we need a much smarter and integrated federal-state policy process if we're going to scale these projects up." DOE named two other less surprising winners yesterday: Seattle-based Principle Power Inc. and Dominion Virginia Power. With its WindFloat project, Principle Power aims to install five 6 MW floating turbines off the coast of Coos Bay, Ore., a project that could be the first to unlock the vast wind power potential off the U.S. West Coast. "We're grateful to DOE for their support, and we're looking forward to getting back to work," said Kevin Banister, WindFloat's project manager. Yesterday, Principle Power also announced that it will team up with Rhode Island-based offshore wind developer Deepwater Wind to complete the WindFloat project. Deepwater Wind is already a leader in the East Coast offshore wind industry, with its Block Island project currently vying with Cape Wind to be the first commercial offshore wind farm in the United States. Dominion Virginia Power, a part of the major U.S. power company Dominion, will install two 6 MW turbines in waters near Virginia Beach. The company is poised to become a major offshore wind player as the United States further pursues tapping the estimated 4,000 gigawatts of power blowing off its shores. Last September, Dominion won Interior's second offshore wind area competitive lease sale, bidding $1.6 million for 112,800 acres of offshore Virginia property. The DOE funding will help the Southeast catch up with the Northeast in terms of bringing offshore wind energy to America's grid, renewable energy supporters said. "It's the only [offshore wind] project that's being led by utilities," said Brian O'Hara, president of the Southeastern Coastal Wind Coalition. "Utilities are going to play a big role here in the Southeast. This is a good way to share some lessons learned with other Southeastern utilities, as well."